The Fall of Man (Date::8 Ethanim 1 AM) was an event that is described in the Biblical book of Genesis, during which the first man and woman (Adam and Eve) sinned against God, and fell from grace. The event is also known as the Original Sin. According to the Bible, this sin brought death into the world, but humans remain immortal beings to be resurrected to eternal life in heaven, or eternal death in hell. The Bible also seems to clearly imply that humans were designed to live immortally in their physical bodies before Adam and Eve committed the original sin. In Genesis 2-3 , God gave Adam and Eve specific instructions not to eat from the Tree of Knowledge or they would die. Despite this command and warning from God, Eve succumbed to temptation by a serpent and ate the fruit, then gave some to Adam, "who was with her". This act of disobedience was the first time that humans had sinned against God, and is therefore, called the original sin. Since Adam is said to have lived to be 930 years old, it is important to examine the nature of the death penalty exacted upon mankind. Eating of the forbidden fruit gave Adam and Eve the ability to judge their own actions as right or wrong, and they instantly recognized they had done something sinful and hid from God. After questioning them, God removed Adam and Eve from the garden, and placed a cherub with a flaming sword to guard the Tree of Life so they could not eat from it. There remains some debate within the theological and creation science community regarding the nature of this immortality. It is important to note that the Hebrew in this passage is more literally translated as "dying thou shall die", which suggests a "progressive" death. A less literal translation is "for as soon as you eat of it, you shall be doomed to die". Nevertheless, because they did not die immediately after eating of the fruit, some Christians interpret this passage to mean that Adam and Eve died that day, but only spiritually. Alternatively, many people assume that Adam and Eve began physically immortal, and began to grow old for the first time on this day. God told Adam and Eve; "you may eat freely of every tree in the garden; but of the tree of the knowledge of good and evil you shall not eat, for in the day that you eat of it you shall die." However, after they ate the forbidden fruit, they did not immediately fall dead. Because of this seeming discrepancy, many Christian interpret this passage to mean that Adam died spiritually that day, or was originally immortal and became a mortal thereby beginning to die. The text would instead suggest that when they committed the original sin, God exacted an indirect penalty of death upon Adam and Eve. If the garden of Eden story is representative of history, humans were created to live forever in a physical body, but God removed their source of immortality on the day they sinned against Him. Overall, it is consistent that humans were doomed to mortality after the Fall. In addition to the Tree of Knowledge of Good and Evil, God also placed a tree in the garden called the Tree of Life. The passage would seem to suggest that this tree was the source of physical immortality for humans, and although God had not forbidden Adam and Eve from eating its' fruit, they had not done so before they sinned. As soon as they ate of the tree of good and evil, God immediately removed Adam and Eve from the garden, and placed a flaming sword to guard the tree so they could not eat from it. 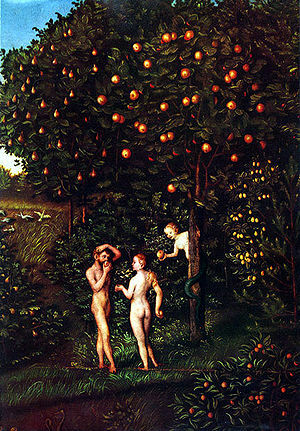 In Genesis 3:22-23 , God is quoted as saying "and now, lest he put forth his hand and take also of the tree of life, and eat, and live for ever" therefore the LORD God sent him forth from the garden of Eden", clearly indicating that Adam was removed from the garden before he would have the opportunity for to eat of the tree of life and become immortal. From this story in Genesis 2-3 , we can conclude that on the day Adam and Eve ate of the "Tree of Knowledge" they experienced their immortal death because God removed their access to the "Tree of Life". This tree, which had been originally placed there for them, would apparently provide some essential factor without which any human would eventually die. It is assumed that the "Tree of Life" was able to transform the biological nature of human beings who were alone designed to eat from the tree and live in this way. However, because our ancestors disobeyed God, they brought death to all mankind through their punishment. Christianity teaches that it is now only by faith in the LORD Jesus Christ that our sins will be forgiven, and we can regain our place with God through eternity. It is important to note that physical immortality is theoretically possible for any lifeform, and the factors which cause organisms to begin to grow old and die remain largely hypothetical. Multicellular organisms are designed so that new cells replace older cells on a never-ending cycle. If a cell is provided all the metabolites and nutrients it needs to survive, its lineage should never die-out. But due to some unknown cause they simply cease. Plants are actually or potentially immortal organisms that will live indefinitely provided their environmental requirements are met. In striking contrast to plants, humans and animals have a maximum life expectancy regardless of whether their needs are fulfilled. Although it is true that some plants grow as annuals, all plants are actually perennials by nature, and have adapted to a programmed life cycle in some instances to match growing seasons. Otherwise, plants only die because of biochemical starvation or disease. If their physical requirements are met, plants will grow indefinitely. The most widely accepted theory to explain cellular mortality proposes that the ends of chromosomes (telomeres) degrade through time, and active genes eventually become affected by similar erosion. However, programmed cell death (apoptosis) is now known to occur, and clearly indicates a control mechanism is governing cellular mortality. Cells are responding to signals we do not yet recognize, and will essentially die on a preprogrammed schedule. It is also now well established that plant and animal cell lines can be easily immortalized. Immortalized plant tissue can be obtained by simply isolating the plant's wound-response tissue called callus. When separated from the plant's signaling mechanism that tell the cells to die, callus will grow indefinitely in tissue culture. Cancer cells are considered immortalized. They have become genetically unresponsive to the signals that would normally restrict cells from replicating their DNA and dividing. Unlike their host organism, immortalized cell lines will continue to grow and divide as long as their necessary elements are maintained. Many creationists argue that both humans and the animals were immortal in the beginning, and no animals on Earth died prior to the fall of mankind. This view is based largely on the use of the phrase breath of life that is shared in common with animals (Genesis 7:22 ), and the word life as in Genesis 1:20 (Hebrew neshesh), which some believe refers to the soul - asserting that animals also have a soul like humans. This perspective is most often voiced by young earth creationists to contest the evolutionary interpretation of the fossil record as being evidence of millions of years of death and decay prior to the presence of humans. It is also noted by proponents of this view that both humans and animals were designed to eat plants at the time of their creation - Genesis 1:29-30 . Carnivorous behaviors probably began as a result of the curse upon the Earth. Likewise, God's own description of the created world was in terms of "very good", which to many is contradictory to the suffering which frequents death. Although the possibility of immortal animals is immediately rejected by many on the grounds that accidental death occurs on a regular basis for many small organisms today (like stepping on bugs). Under examination, such distinctions between humans and other creatures do not hold up. Accidental deaths are as likely for humans as for almost any other organism. There may be no generalized scenario that would cause the death of another organism that could not also happen to humans. In fact, humans are one of the most environmentally fragile of all organisms on earth. But, in contrast, the exoskeleton possessed by the average insect can handle several hundred times its weight. Nevertheless, this arguments overlooks the obvious purpose of the tree of life, to provide the immortality that God intended humans to have. The fall of man resulted in the removal of Adam and Eve from the garden of Eden to prevent their access to the tree of life and immortality. It is also noted that animals and humans alike were designed to eat plants and frequently kill them upon harvest. In Addition to being removed from the Garden of Eden and being separated from the Tree of Life, there were other curses exacted upon the creation as a result of the sin of Adam and Eve. Farming in mass quantities to obtain food seems to have only been a requirement after Adam was cursed for his sin. As plants were created to be food for humans and animals alike (See: Genesis 1:29-30 ), it is logical that we were both originally created with the ability to digest plant fiber (cellulose), and there was no need for us to grow crops in the beginning. This is further supported by the fact that humans have an appendix organ in the digestive system; it is vestigial today, but scientists agree that it was originally intended to digest plant fiber/cellulose. Today, we must farm in order to obtain sufficient amounts of energy, which otherwise exists in abundance within cellulose. The entire plant is basically made of pure sugar, which is what virtually all organisms metabolize for energy, but most of the metabolites made by plants are indigestible by humans and animals. This conundrum is inexplicable from an intelligent design perspective aside from a cursed world. ↑ Morris, Henry M., The Genesis Record. Grand Rapids MI: Baker Books, 1976. p.86. ↑ 2.0 2.1 Morris, Henry M., The Genesis Record. Grand Rapids MI: Baker Books, 1976. p.69. ↑ 3.0 3.1 3.2 Morris, Henry M., The Genesis Record. Grand Rapids MI: Baker Books, 1976. p.79. ↑ Morris, Henry M., The Genesis Record. Grand Rapids MI: Baker Books, 1976. p.78. ↑ "Designed to Eat Plants, Then Cursed to be Unable." Northwest Creation Network, n.d. Accessed October 24, 2008. Adam and Eve will Surely Die, Sudden Death? This page was last modified on 27 August 2015, at 19:52.